Three years ago today Rick and I sat in a room with three doctors as a nurse walked in and placed a bag full of bone marrow on a pole and hooked it up to a central line that went directly in Aren's chest with the belief that this would save his life and that he would be able to be our son on this earth a little longer and grow and live like other children do. Three years ago today I watched in awe as this bag of bone marrow made it's way through the tubing and into Aren's body and with no one telling it what to do, found it's way into his bones and decided to make a new home and begin saving Aren's life. Three years ago today I prayed and thanked Heavenly Father for the person whom we didn't know at the time, who donated this bone marrow to help Aren live. I begged Heavenly Father to let him live. 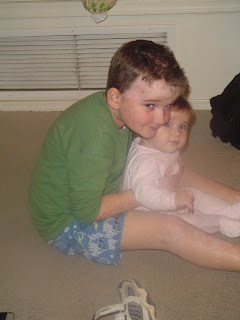 I couldn't handle the death of another child knowing that it was a condition Rick and I had passed on to him because of recessive gene we didn't know we had. Today I look at Aren and thank my Heavenly Father for answering the pleadings of a mother who didn't deserve them. Every day I am grateful for this little boy who continues to grow and develop and learn. Every day I am grateful that he knows he is special and was saved to do a special work on this earth. Every day I realize how lucky and blessed I am to be his mother. Thank you to everyone who has made this anniversary possible...to the doctors at Children's National Medical Center, to George Fleming, the man who signed up to be a bone marrow donor in 1987 but was never called until the summer of 2005 to save the life of a five year old boy, to my sweet husband who suffered as he watched from a distance the happenings of the transplant unfold but was always was there for me, to Lily, who I'm sure gave up her life so the doctors could concentrate on Aren, and of course to Aren, a boy who showed the courage of a man as he endured a lifetime of life changing experiences in the first six years of his life. You are each a hero. Jeepers a post of yours that made me cry and not of laughter... You are a strong woman! You are an amazing strong family! I'm so glad your prayers were answered, Aren will always have a huge impact on everyone around him. ok, so you got me crying. We love you guys and are so greatful for you and your family. You are all stuch a strength to us. Now I am all teary eyed! Thanks. Thanks for this beautiful post to your dear son. It brought tears to my eyes and gladness to my heart. I am so happy that HF answered your prayers. I can only imagine the loss of 1 child and then facing the possibility of losing another.....Hugs MB you have a very special family! You have me crying,What a happy, happy day! Aren is a wonderful kid. What a great post! Thanks for sharing Aren with us, MaryBeth! He is an awesome boy! Thank you for this Post, Aren is such an amazing little Man. This is so neat to hear Aren's and your families story. What a journey! I'll bet on the days you look back and wonder how you made it through all of that comes great joy in knowing he is a miracle! Modern medicine is wonderful, but faith and blessings can bring miracles too. I'm so glad to know you and Aren, you're an inspiration to us! That's nice, Mary. We can't wait to see you guys in December. Let's go to Children's!